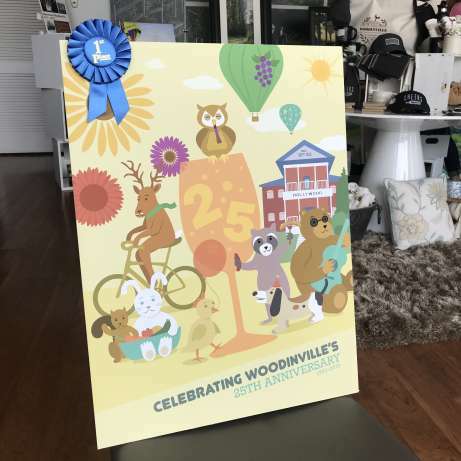 The City of Woodinville, in partnership with the Woodinville Chamber of Commerce and the Woodinville Arts Alliance is pleased to announce the 6th Annual Celebrate Woodinville Art Poster Contest. Entries that illustrate this year’s contest theme of “Farm to Forest” are currently being accepted. The deadline for submittal is Friday, May 31st, 2019 at 12:00pm PST to Woodinville City Hall (17301 133rd Ave NE Woodinville, WA 98072). The first, second and third place winners will have their posters on display at the Celebrate Woodinville Festival on Saturday August 17, 2019. The posters will also be displayed for a limited time at the Woodinville Visitor’s Center and at Woodinville City Hall. Artwork from first-place winner will also be available for sale at the Celebrate Woodinville Concerts in the Park and at the Celebrate Woodinville Festival. Participating adult (17+) amateur and professional artists will eligible to receive the following prizes: $500 for first place, $300 for second place, and $200 for third place. Submissions from artists aged 13-16 and 12 and under will be judged separately and will be eligible for a first-place ribbon. Questions about the contest can be directed to Carol Hook with the Woodinville Arts Alliance by email: carol@carolhook.net, or by phone: 425-213-6367. The Woodinville Arts Alliance (WAA) is a newly formed Washington State non-profit corporation. WAA’s mission is “to promote the integration and appreciation of art in the day to day life of our community”. WAA formed in January of 2017 and is currently working on several projects along with the Celebrate Woodinville Art Poster Contest. Such projects include a Juried Art Show at the Celebrate Woodinville Festival, rotating art displays at participating wineries and breweries, Pop Up art displays and a Studio Tour in 2018. For information regarding the WAA, please visit their Facebook page: www.facebook.com/WoodinvilleArtsAlliance.